Here it is folks, the first mega-meeting the Houston PVA has had in a long time. If you own, are using, or are thinking of using a DSLR in video (even if you only shoot stills now) you do NOT want to miss this opportunity. You will be coached by two of Houston’s finest wedding filmmakers, Robert Harrington and Christopher Shepherd. 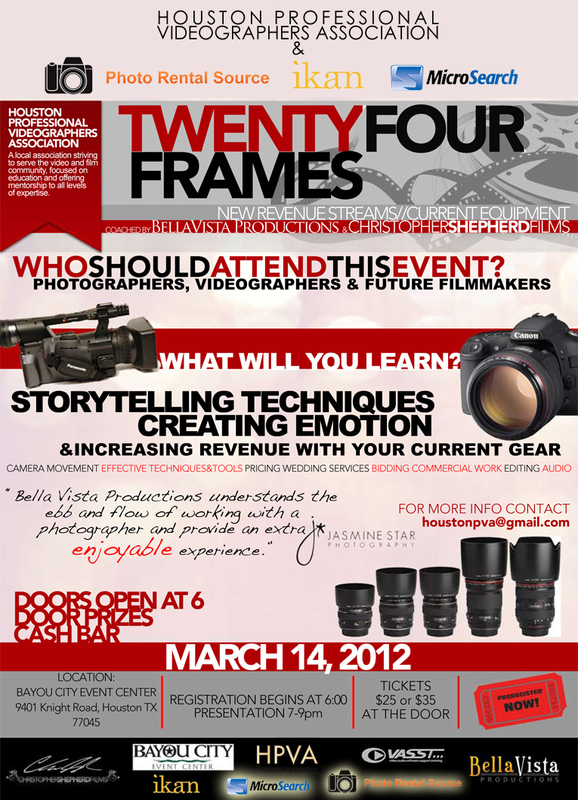 They will take you through camera bodies, lenses, audio, editing and delivery, and more.This workshop will also feature a Q&A session, a cash bar, show specials from our sponsors, and several doorprizes.The cost for this workshop is only $25 early registration or $35 at the door.Here’s a tip: Your best buy is to join the Houston Professional Videographers Association for $100 and get this workshop FREE!